Introducing our first guest post ever! It’s nice that it’s been only a week since we launched the blog, and we already have a guest post! Well who’s it from? It’s from Stacy B Miller, a full-time financial writer and editor. For 4 years, she has written various articles for law firms and other financial websites. She has mainly written articles specifically focusing on personal finance, debt, credit, laws, budgeting, news, industry updates, and other money topics. You will find my notes on the article further below. Without further ado…. Social media is not just for connecting with friends and family anymore. It’s a platform to thrive in the society smartly. With the advent of smartphones, the power of social media has increased manifold. Now, you can use social media to stay updated on the current affairs, share information and save a good amount of money. Social media is not just for casual conversations. If you can use it wisely, you can save a lot of money. Here are a few tips. You can get 1000 from YouTube. You can learn about the simple and frugal ways to decorate your home. You can check out the videos on how to make budget-friendly breakfast or lunch. That’s not all. You can learn about how to use old clothes wisely and turn yourself into a fashionista. Join Facebook and Twitter contests and win attractive prizes. Watch for announcements from your favorite companies. If you win the contests, then you may win a movie ticket or coupons or other prizes. Many people are flocking to Reddit boards for getting couponing tips and frugal living tips. You can join the discussion there and know about apps that can help you save money. If you’re lucky, you can get coupon codes as well. Do you want to grab a good deal on a branded watch? Just think about friends or relatives who bought a branded watch recently. Ask them on Facebook or Twitter about their feedback. A few simple questions – “Where can I get a branded watch? Which store is giving the biggest discount?” can help you a lot. There is a plethora of money-saving communities on Facebook. Join those communities where members share coupon codes and store deals. There are communities for Target, Whole foods, and other retail stores. You can find killer deals on airfare, vacation packages and hotels from Twitter accounts like @farecompare, @airfarewatchdog, etc. Just follow these twitter accounts when you’re looking for some good deals and coupons. For instance, @airfarewatchdog tweets latest airfare deals every 10-20 minutes. They also inform you about any price slash so that you can book tickets instantly. Go to the ‘settings’ option in Pinterest. Flip your notification to ‘yes’. When the price of a Buyable product drops, you’ll get a notification immediately. You can buy the product before it sells out. After Facebook, Twitter, and Pinterest, several companies are joining Snapchat for marketing their products. Here is the deal. You can snap a picture of their item and the company will snap you back a coupon code. Groupon is the best example for this. A good tip is to use specific hashtags searches on Twitter, Instagram, and Facebook for getting great deals. You can use a specific hashtag searches like #(your product)deals or #(your product) coupon. The other hashtags you can use are #freebie, #discount, #giveaway, #offer, #extremecouponing, #specials, etc. Follow the social media profiles of small businesses in your locality. Small businesses often resort to social media to advertise sale offers and great deals. A lot of companies offer exclusive deals for their social media followers. ‘Like’ your favorite brands on Facebook for getting good coupon codes. Don’t forget to use the ‘save’ feature on Facebook for future reference. Suppose, you like something on Facebook but you’re too busy to check out the details of the offer. You can save the link for future reference. You won’t miss out great deals. Blogging is another way that can help you bring in extra money. Some people are able to make money from it such as MakingSenseofCents. She makes $100,000+/month blogging. It would allow me to FIRE (Financially Independent, Retire Early) even sooner and be able to do what I love to do most (writing, and dishing out financial advice) from home. It would allow me to see Baby99to1percent more and to drop her off and pickup her up from daycare everyday. Unfortunately, it’s hard to find a remote Finance job that pays well. On the other hand, blogging would allow me to work from home and would save me a lot of mulla; No more 2nd car, gas to drive to the train station, expensive monthly train passes, business attires… I could work in my pyjamas just like Mr99to1percent 😊 😊 😊… In total, that’s probably at least $1000/month of savings right there. If the blog doesn’t make money, it would still be ok because like I said I looooove dishing out financial advice (and relationship advice by the way) whether online, offline, or even just in my head 😊. So I might as well put it in writing/blog about it. Overall, I really loved Stacy’s article. It’s full of useful tips and I learned a lot myself. I just followed those twitter accounts she suggested and I’m going to put them to use for our trip to Europe next year. We are visiting family who hasn’t been able to visit to see Baby99to1percent since she was born. Feel free to comment and let us know what you think about the tips above and share with us other tips that you might know. We can all learn from each other. You agree to share the guest post on your social media platforms, link to it on your blog, and reply to comments. Again, feel free to comment and share. We love ya and wanna get to know ya! 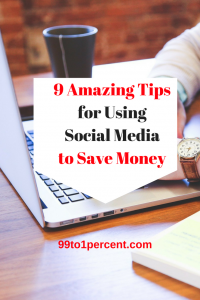 When I saw the headline I was like – how on earth can I save money using social media? Then I saw the point when I read the post. It was a good read. I’m glad you you found the tips useful. I like these tips. Great for us old people who need the cliff notes versions to keep up! Thanks for putting this together.